I am so excited about my new product that I just created and uploaded to Teachers Pay Teachers! I am new to blogging and need a place to keep track of EVERYTHING blog related: post ideas, giveaways, to do list, etc.! I searched online and couldn't find one that had everything I wanted so, I created my own! I have customized it to be coil bound at an office store or you can also hole punch it and throw it in a binder. I wanted to feel fancy so I had mine bound! You can put yours together anyway you would like and feel will meet your needs the best. After lots of re-arranging I put mine together as follows! 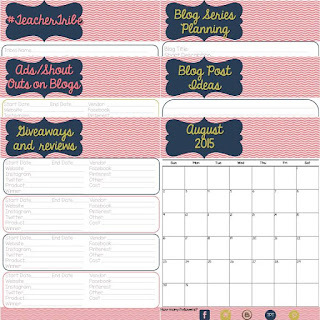 The calendar is my favorite part as I added the icons for Facebook, Instagram, Blogger, Teachers Pay Teachers and Pinterest so you can track your followers and progress! I suggest doing it at the beginning or end of each month, but stick with whatever you choose for your first month! A great place to keep track of what you are giving away or when people do reviews on your products! Keep track of your #TeacherTribe's. If you haven't found yours yet you should! It's a great place to network with other teachers and is a great support system! I have SO many teacher passwords and need to keep them in one place! I know, I know, you shouldn't write your passwords down but how do you expect me to remember them ALL! This is how I organized mine! If you are new to blogging or are looking for a great product check it out! Click on any of the pictures and it will take you to my Teachers Pay Teachers store! Here is the exact same product but a different color scheme!